In botany, mint is the common name for any of the various herbaceous plants comprising the genus Mentha, a taxon of about 25 species of aromatic, almost exclusively perennial plants in the mint family Lamiaceae. They are characterized by wide-spreading, underground rhizomes; erect, square, branched stems; paired, oppositely arranged leaves; and small, tubular flowers arranged in clusters. While members of Mentha are known as the "true mints," some plants in other Lamiaceae genera use mint in their common name and the entire family is known as the mint family. In common usage, several other plants with fragrant leaves may have the common name of mint associated. Vietnamese mint, commonly used in Southeast Asian cuisine, is not a member of the mint family Lamiaceae. True mints are cultivated for an aromatic essential oil in the stems and leaves, which is used for flavoring, perfumes, and medicinal purposes, with fresh and dried leaves and extracts (like menthol from mint essential oil) also used for culinary, medicinal, and cosmetic purposes. Peppermint (Mentha piperita) and spearmint (Mentha spicata) are two of the most important commercial species. The mints provide a unique flavor and aroma, which has delighted people for centuries. Offering an aromatic, sweet flavor, with a cool after taste, they are used in both sweet and savory dishes, such as teas, beverages, jellies, candies, ice creams, and lamb dishes. Mint essential oil and menthol are an ingredient of such non-prescription products as flavorings in breath fresheners, antiseptic mouth rinses, toothpaste, and chewing gum, and menthol is used for such medicinal treatments as short-term relief of minor sore throat, an antipruritic to reduce itching, a topical analgesic to relieve minor aches and pains, and as a decongestant. Many elements of the mint plant, which are so essential to the plant's reproduction and survival, also provide a larger value for the ecosystem and humans. Menthol in the essential oil, for example, helps repel pest insects from the plant, while also helping to remove mites from pollinating bees and offering many values for humans, noted above. Mint flowers provide bees a nectar source. Like menthol, L-carvone, a key component in making the scent and taste of spearmint, also acts as an insect repellent. Lamiaceae (or Labiatae), the mint family, is the flowering plant family to which true mints (Mentha sp.) belong. It has about 210 genera and some 3,500 species. Lamiaceae plants are frequently aromatic in all parts and include many widely used culinary and medicinal herbs in addition to true mints, such as oregano, rosemary, sage, savory, marjoram, basil, thyme, and lavender. Many members of the family are widely cultivated, owing not only to their aromatic qualities but also their ease of cultivation: these plants are among the easiest plants to propagate by stem cuttings. The leaves emerge oppositely, each pair at right angles to the previous one (called decussate) or whorled. The flowers are bilaterally symmetrical with five united petals, five united sepals. Mentha (mint) is a genus of about 25 species (and many hundreds of varieties) (Davidson 1999). Species within Mentha have a subcosmopolitan distribution across Europe, Africa, Asia (Brickell and Zuk 1997), Australia, and North America. Several mint hybrids commonly occur. True mints are aromatic, almost exclusively perennial, rarely annual, herbs. They have wide-spreading underground rhizomes and erect, branched stems. The leaves are arranged in opposite pairs, from simple oblong to lanceolate, often downy, and with a serrated margin. Leaf colors range from dark green and gray-green to purple, blue and sometimes pale yellow (Brickell and Zuk 1997). The flowers are produced in clusters ('verticils') on an erect, terminal spike or in separate wholes, and are white to purple. The flowers have a corolla with two lips with four subequal lobes, the upper lobe usually the largest. The fruit is a small dry capsule containing one to four seeds. All Mentha species are characterized by an essential oil (volatile oil) in resinous dots in the foliage. 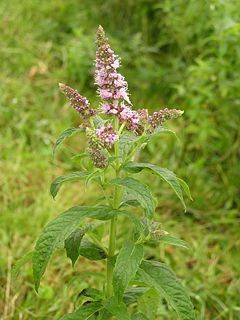 While the species that make up the Mentha genus are widely distributed and can be found in many environments, many grow best in wet environments and moist soils. Mint grows wild throughout the world (Herbst 2001), and peppermint and spearmint, which are European plants, now grow wild in North America. Mints will grow 10–120 centimeters tall and can spread over an indeterminate sized area. Due to the tendency to spread unchecked, mints are considered invasive in various environments (Brickell and Cole 2002). The substances that give the mints their characteristic aromas and flavors are menthol (the main aroma of peppermint and Japanese peppermint) and pulegone (in pennyroyal and Corsican mint). The compound primarily responsible for the aroma and flavor of spearmint is L-carvone. Two of the most well-known and widely available species are Mentha piperita, known as peppermint, and M. spicata, or spearmint. Peppermint has bright green leaves, and stems that are purple tinged; it has a peppery flavor and is more pungent than spearmint (Herbst 2001). Spearmint has green or gray-green leaves, lacks a leafstalk, and has a milder flavor and fragrance (Herbst 2001). The essential oil of these plants is used for flavoring, such as in chewing gum or to disguise the tastes of medicinal drugs. Mint is cultivated in Europe, Asia, and the United States, with peppermint and spearmint the most important commercial species (Herbst 2001). Below is a selection of what are considered to be pure species of mints. Listed here are accepted species names and common names (where available). The mint family has a large grouping of recognized hybrids. All mints prefer, and thrive, in cool, moist spots in partial shade (Bradley 1992). In general, mints tolerate a wide range of conditions, and can also be grown in full sun. They are fast growing, extending their reach along surfaces through a network of runners (rhizomes). Due to their speedy growth, one plant of each desired mint, along with a little care, will provide more than enough mint for home use. Some mint species are more invasive than others. Even with the less invasive mints, care should be taken when mixing any mint with any other plants, lest the mint take over. To control mints in an open environment, mints should be planted in deep, bottomless containers sunk in the ground, or planted above ground in tubs and barrels (Bradley 1992). Some mints can be propagated by seed. Growth from seed can be an unreliable method for raising mint for two reasons: mint seeds are highly variable, one might not end up with what one presupposed was planted (Bradley 1992); some mint varieties are sterile. It is more effective to take and plant cuttings from the runners of healthy mints. Mints are supposed to make good companion plants, repelling pest insects and attracting beneficial ones. Harvesting of mint leaves can be done at anytime. Fresh mint leaves should be used immediately or stored up to a couple of days in plastic bags within a refrigerator. A bunch of mint also can be refrigerated for up to a week, stems down, in a glass of water covered by a plastic bag, with water changed every two days (Herbst 2001). Optionally, mint can be frozen in ice cube trays. Dried mint leaves should be stored in an airtight container placed in a cool, dark, dry area (Ortiz 1992). A jar of mint jelly. 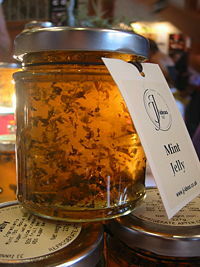 Mint jelly is a traditional condiment served with lamb dishes. The leaf is the culinary source of mint. Mint may be used fresh, dried, as an extract, or as an essential oil (oil of peppermint, oil of spearmint) (Herbst 2001). Fresh mint is usually preferred over dried mint when storage of the mint is not a problem. The leaves have a pleasant warm, fresh, aromatic, sweet flavor with a cool aftertaste. Menthol is an organic compound extracted from peppermint or other mint oils (and also made synthetically). Mint is used in both sweet and savory dishes. It is used in teas, beverages, jellies, syrups, candies, and ice creams. In Middle Eastern cuisine, mint is used on lamb dishes. In British cuisine, mint sauce is popular with lamb. Mint is a necessary ingredient in Touareg tea, a popular tea in northern African and Arab countries. Alcoholic drinks sometimes feature flavor of mint, namely the Mint Julep and the Mojito. Crème de menthe is a mint-flavored liqueur used in drinks such as the grasshopper. Mint essential oil and menthol are extensively used as flavorings in breath fresheners, drinks, antiseptic mouth rinses, toothpaste, chewing gum, desserts, and candies; see mint (candy), and mint chocolate. Methyl salicylate, commonly called "oil of wintergreen," is often used as a mint flavoring for foods and candies due to its mint-like flavor. It is produced from the "wintergreen" group of plants, notably Gaultheria species. Mint was originally used as a medicinal herb to treat stomach ache and chest pains. To cure stomach aches, dried mint leaves are put in boiling water, which one drinks when it cools. This tea is called monstranzo. During the Middle Ages, powdered mint leaves were used to whiten teeth. Mint tea is a strong diuretic. Mint also aids digestion. Menthol from mint essential oil (40-90 percent) is an ingredient of many cosmetics and some perfumes. Menthol and mint essential oil are also much used in medicine as a component of many drugs, and are very popular in aromatherapy. For example, menthol is used in non-prescription products for short-term relief of minor sore throat and minor mouth or throat irritation (lip balms, cough medicine); as an antipruritic to reduce itching, especially in insect bite treatments; and as a topical analgesic to relieve minor aches and pains such as muscle cramps, sprains, headaches, and similar conditions. It also is used in decongestants for chest and sinuses (such as Vicks Vaporub); in certain medications used to treat sunburns, as it provides a cooling sensation (then often associated with aloe); and as an additive in certain cigarette brands, for flavor, to reduce the throat and sinus irritation caused by smoking, and arguably to reduce the bad-breath smokers experience and possibly improve the smell of second-hand smoke. In Rome, Pliny recommended that a wreath of mint was a good thing for students to wear since it was thought to "exhilarate their minds." Mint leaves are often used by campers to repel mosquitoes. It is also said that extracts from mint leaves have a particular mosquito-killing capability. Mint oil also is used as an environmentally-friendly insecticide for its ability to kill some common pests like wasps, hornets, ants, and cockroaches. On the other hand, mint plants are used as food plants by the larvae of some Lepidoptera species including Buff Ermine. Mint descends from the Latin word mentha, which is rooted in the Greek word minthe, mentioned in Greek mythology as Minthe or Mentha, a nymph. According to Greek mythology, Mentha angered Persephone, wife of the king of the underworld, and Persephone turned her into the pungently sweet-smelling mint (Herbst 2001). The word itself probably derives from a now extinct pre-Greek language (Quattrocchi 2000). Mint leaves, without a qualifier like peppermint or apple mint, often refers to spearmint leaves. In Central and South America, mint is known as hierbabuena (literally, "good herb"). In Lusophone countries, especially in Brazil, mint species are popularly known as "Hortelã." In the Hindi and Urdu languages it is called Pudeena. As an English colloquial term, "mint" stands for any small sugar confectionery item flavored to taste like the aforementioned plant (Davidson 1999). Bradley, F. M. 1992. Rodale's All-new Encyclopedia of Organic Gardening. Emmaus, PA: Rodale Press. ISBN 0878579990. Brickell, C., and J. D. Zuk. 1997. The American Horticultural Society: A-Z Encyclopedia of Garden Plants. New York, NY: DK Publishing. ISBN 0789419432. Brickell, C., and T. Cole. 2002. The American Horticultural Society: Encyclopedia of Plants & Flowers. New York, NY: DK Publishing. ISBN 0789489937. Davidson, A. 1999. The Oxford Companion to Food. Oxford: Oxford University Press. ISBN 0192115790. Ortiz, E. L. 1992. The Encyclopedia of Herbs, Spices & Flavorings. London: Dorling Kindersley. ISBN 1564580652. Quattrocchi, U. 2000. CRC World Dictionary of Plant Names: Common Names, Scientific Names, Eponyms, Synonyms, and Etymology, volume 3. Boca Raton: CRC Press. ISBN 0849326737. This page was last modified on 17 September 2018, at 21:32.